Sony SRS-BTM8 review | What Hi-Fi? In the flesh, the Sony is a very classy-looking unit. The design has been cleverly thought out, from the integration of a carry handle, to the roles of the buttons positioned along the centre of it. 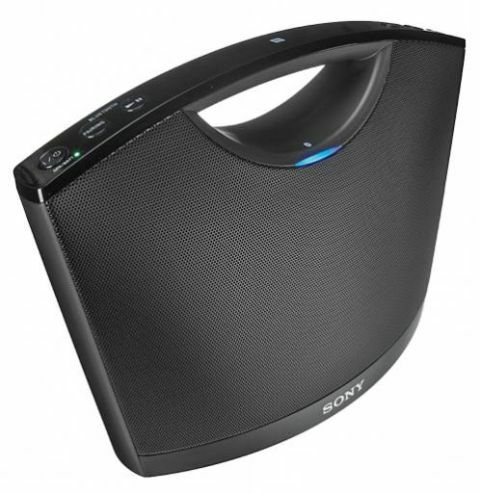 The speaker is either mains-powered, or you can feed four AA batteries into the compartment tucked away in the base. While Bluetooth is the Sony’s primary function the BTM8 does so with the help of NFC or Near Field Communication technology to help things along. Should you happen to own an NFC-enabled smartphone such as Sony’s own Xperia X or the Google Nexus 4 or HTC One XL, you can pair the handset to the speaker simply by touching it next to NFC icon on the centre of the carry handle. Your phone automatically turns Bluetooth on and connects in a matter of seconds so you’re ready to stream – it’s a neat, convenient way to connect and it’s only going to gain popularity and prominence. As with the vast majority of speakers at this level, there’s an element of thinness to the Sony’s treble, but it isn’t overly spikey or splashy. Low frequencies display a decent sense of weight for the unit's size, while there’s good control and definition on offer too. The SRS-BTM8 drives along to Spector’s Celestine with gusto – guitars, drums and vocals all combine to produce a relatively seamless listen. If you need a Bluetooth speaker that’s nice to use and can handle decent volumes in decent-sized rooms, then the Sony should be near the top of your list.